The Barents Sea to the north of Norway is estimated to contain almost half of the recoverable undiscovered resources remaining in the Norwegian Continental Shelf (NCS). At present only two fields, Statoil's Snøhvit and Eni's Goliat, are in production but a number of discoveries since 2011 have the potential to be stand-alone developments and are currently being appraised. The recent 23rd licensing round awarded acreage exclusively in the Barents and for the first time included the frontier South East Barents. Statoil has already indicated that it plans to drill the high-risk/high-reward Korpfjell prospect located in PL859 in this frontier area as part of a five to seven well Barents exploration programme in 2017. Ten licences were awarded in the 23rd round announced in May 2016. Most licences were located around existing discoveries Wisting and Alta, although three were awarded in the Southeast Barents close to Norway’s maritime boundary with Russia. The licence that generated most interest from companies is reported to have been PL859, the most northerly and largest (covering 12 blocks) of the licences on offer. Operator Statoil has announced that it plans to drill the Korpfjell prospect here in 2017, while partner Lundin has identified a structural closure on the licence that it estimates to be more than four times the size of that seen in Johan Sverdrup. 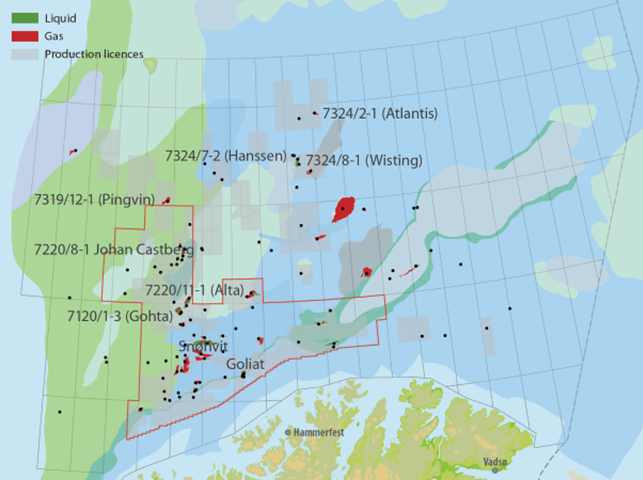 Statoil’s Johan Castberg, OMV’s Wisting and Lundin’s Alta/Gohta fields have all been discovered since 2011 and have the potential to be developed. Appraisal drilling is ongoing at Wisting and Alta/Gohta, while Statoil has been working to reduce costs at Johan Castberg before a concept selection delayed from 2015 into H216. Although the Barents is located in the Arctic, the region is ice-free year round due to the effects of the Gulf Stream and water depths are less than 500m. However, reservoirs can be very shallow, raising separate challenges. OMV successfully drilled the horizontal Wisting Central II appraisal well in 2016, demonstrating that the well trajectory can be drilled from vertical to horizontal within a 250m section. Lundin is planning to drill two exploration wells, Neiden and Filicudi, in its focus area of the Loppa High once it completes work on ongoing appraisal well Alta-3. Eni will drill its Bone prospect (also known as Dazzler by partner Faroe) in late 2016/early 2017. Statoil is planning to drill between five and seven wells across the Barents in 2017, with the Korpfjell well expected to attract considerable interest.